Two lovers face a bleak future in 1960s Seoul. 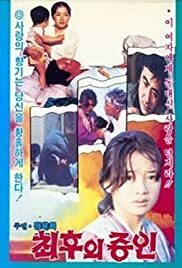 Situated in the small poverty stricken town of Woomukbaemi, South Korea, this film centers on a clothes factory manager and the triangular relationship between himself, his insatiably jealous and violent wife, and one of his employees. Foreign correspondent Pete Garvey has 5 days to win back his former fiancée, or he'll lose the orphans he adopted. A Sunday at the beach for the Passaguai family is a succession of more or less pleasant adventures.